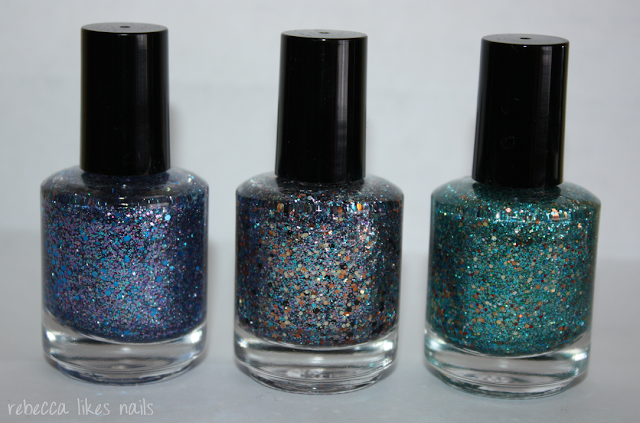 Today I'll be showing three more pretties that were sent to me from Shimmer Polish. Click the above photo to zoom in and see those pretties up close! As I said in previous Shimmer posts (here & here), Shimmer Polishes are crazy glitter mixes that you can tell weren't just thrown together. Each one is so complex! And so glitter-dense, with a great formula. I have zero complaints about these polishes! Just. Look. At. All. The. Glitter. It's so pretty, I can't handle it! And Leslie is my middle name! So it's extra special. But when will there be a Shimmer Rebecca? Hmm? HMM?! I love the blues and purples in this one but I could probably do without the orangey glitters. Even though this one isn't one of my faves, it's still great. Nice and sparkly. Just how I like it. Purdy greens and teals. I'm gonna assume this might have been inspired by Jasmine the Disney Princess, and it definitely reminds me of her! The blues and greens could represent her clothes and then the oranges and golds are like her jewelry and skin and the tiger! Haha. Like the last polish, I could do without the orange glitters, but they do make sense in the mix. I wore this as a full manicure and I just love how much it sparkles because of all the different glitters. All Shimmers are that way. What do you guys think of these polishes? I hope you like them as much as I do! These are pretty. I really love Jasmine. Love the last 2, gorgeous! I love these, I even love the orange in Jasmine! Those close ups look really cool!